Apps on Facebook can be great, but they can also be a right pain in the neck. On one hand, there’s useful apps like Spotify or Last.fm which make it easy to share your music taste with your friends. Mostly these are welcomed and vaguely interesting for the friends to view. On the other hand, there’s annoying games and spammy viral apps that post things on your timeline. There are several ways to clean up the apps you’re using and ensure your privacy settings for apps are set just right. There are also some easy ways to remove and report applications when required – like when you’ve accidentally clicked on a viral scam app. Here’s what you need to know. When your absent-minded friend installs yet another dodgy application, how much information do you want the developers to find out about you? And what about this way around – if you’re using a new game, how much information do you want the developers to know about your family? Your grandmother? Your kids? This is the reason people need to check privacy settings for applications. Until you lock down your privacy, you never really know what information is being collected about you and your friends via apps you or your friends may have installed. Scary, isn’t it? Go to the drop-down menu in the top right of Facebook and choose “Privacy Settings“, then choose to edit the settings for “Ads, Apps and Websites”. From here you can choose exactly what information can be seen by applications your friends install. Since you don’t know anything about the developers of most apps or what your friends might install, un-checking most of these boxes is a great idea. Then, if you care about your family and friends, teach them how to do this too. There are two main ways to get a list of all your apps. Firstly, you could go to the arrow at the top-right of Facebook and choose “Account settings” and then choose “Applications“. Secondly, you could navigate from the Facebook Home page to the “App Center” using the links on the left hand side, then choosing “My Apps” from the menu on the left. Either of these options will give you a list of all the applications you have authorised for your account. Although, the second method has the option of sorting by “Last used“, which is handy when searching for something you recently added or got annoyed by. To remove the applications, just click on the cross to the right of each application. Remove anything that looks suspicious, unfamiliar or unused and you could clean up your apps in no time. And don’t worry, if you remove something useful it can always be added again later. It’s no big deal. It happens all the time. People see an update in their feed from a friend claiming to let them view a certain video or see who looks at your Facebook profile. They click on it impulsively because they’re curious and instantly they have posted that same update on to all their friends. The viral app continues to annoy and intrigue their friends and the cycle continues. So, how do you get rid of it? Every update on your timeline can be removed and the application may be reported as spam. Simply head to your timeline and click on the edit pencil in the top-right of the update. The menu for an update will show a “Remove” option and a “Report Spam” option, while a clustered bundle of information from an application will show options to “Remove Application” or “Mark As Spam“. If you accidentally remove the post first, you can use the methods above for cleaning up your apps to remove the app, which should show as recently used. If you hate getting reminders and requests from apps, there’s an easy way to block them. Head to the Facebook Home page and choose “App Center” from the menu on the left, then “Requests“. You’ll see a list of all your recent requests from apps. From here it’s simple – just click on the cross to the right of a request and it will give you the option to block the application completely. Or if you’re always getting requests from the same person, you can block that person’s requests completely instead. We went through this in detail recently in the article “How To Get Rid Of Facebook Notifications & Other Annoying Things You Don’t Want To See“, but it’s worth noting quickly here too. If an application shows up in your news feed that you find annoying, just click the drop-down arrow to the right and choose “Hide” from the menu. It will then give you the option to block the application or the person who made the update. Most of the time, hiding the application is the best move. What bugs you about Facebook apps? Tell us all your pet moans and groans in the comments! By Angela Alcorn of “Make Use of” original article appears here! In this week’s address, President Obama says that Congress should act to keep our nation moving forward by keeping taxes low for 98 percent of Americans, cutting red tape so responsible homeowners can save about $3,000 a year on their mortgage by refinancing at lower rates, and creating a veterans jobs corps to help our returning heroes find work. Abortion has resurfaced as a fighting word in this year’s election campaign — no more so than in Virginia, where controversy over new abortion restrictions may have backfired against Republican leaders, giving Barack Obama and his Democrats a boost. 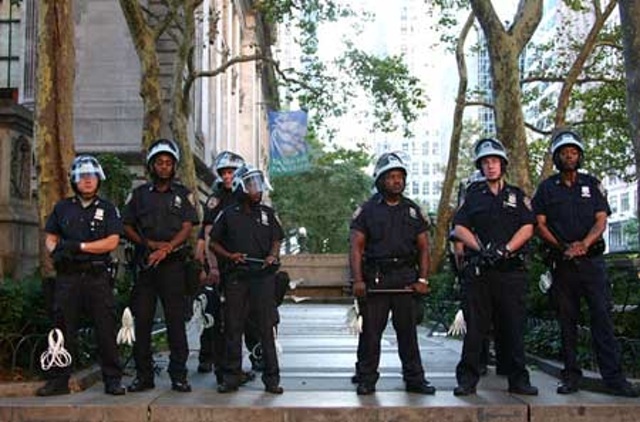 New York Federal Court ruled that a huge chunk of mass arrests issued by the NYPD were unconstitutional. The arrests in question took place at the Republican National Convention in 2004, and the police actions there resulted in 1,800 detained – the most ever during a political convention in the US.